Hand Forged Grade 60 Rebar. Hardness 52-56RC. Water quenched. REBAR FORGING BULLET POINTS: No BS. Just 60 grade Rebar Data that is accurate. Ease of forging: Very easy with limited worry of cracking. Similar to RRS (Railroad spike). forge at bright orange to yellow. Quench in water at bright red to achieve maximum hardness. Tempering is not needed (My opinion). Treat this material like RRS. Spring action/blade flex and durability: surprisingly strong spring action when quenched, in my first cases of forging it has exceeded RRS. When quenched I tested it by bending it at hardened and non hardened areas and the hardened areas spang back to shape without any problem at all. All data that I have researched on Grade 60 rebar yielded the exact same field results. The myth that it has no standard of quality or material content is greatly blown out of proportion. The carbon content must be maintained to be graded at 60 because the carbon is the deciding factor on rigidity and hardened strength. From my test I would say the carbon is between 0.40% and 0.50% carbon. It reacts very much like RRS when forged and has great spring action. some 40 grade may have higher or lower carbon but grade 60 “sofar” appears to be accurate to the letter from its data sheet. In my opinion I would rate this material is possibly best material for making decorative or usable pieces because it does harden so well and is very durable. my testing to me atleast has proven why so many custom knife makers have had great success with 60 grade rebar knives. I do recommend this material for blades but I suggest you do your own field testing and research before coming to your own conclusion. I would also like to say that the Data sheet I read regarding grade 60 stated in plain text that this material does quench harden as a standard feature , so this may clear up the “will/won’t it harden” argument. A note: While researching this material online a common comment has come about that grade 60 cannot be welded easily and some cases at all. This would indicate high carbon content. This is from internet research, forums and comments regarding working with rebar in industrial and artistic applications. I hope this helps any one who is seeking the same answers I have regarding rebar. NOTE* This post will be upldated with a link to the data page when I find the link again. This entry was posted on June 13, 2011 by .. 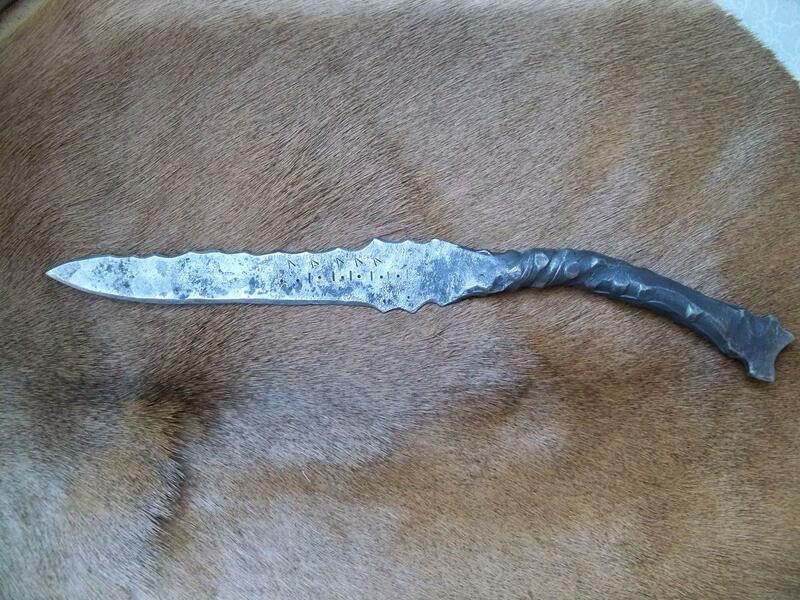 It was filed under Knife making-Blacksmithing and was tagged with forged dagger, forging rebar, grade 60 rebar, grade 60 rebar knife, Hand forged rebar, rebar athame, rebar cobon content, rebar dagger, Rebar Knife, steel athame, wiccan dagger, witchcraft dagger.